The three-reel Alchemists Lab video slot has just one payline, but players still get to have fun as the maximum return is 10,000 coins. Bet 1 to 3 coins on a win line, and with the $3 maximum bet you can hit the $30,000 worth jackpot. 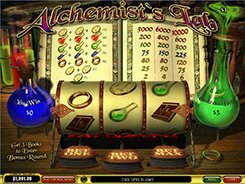 The slot machine is centered around alchemy, so you will come across themed symbols like lab beakers, golden coins, rings and blue jars. To hit the grand prize, you should get three golden coins on the single payline. Three books start a bonus game. You will have to select three potions to mix together to create a gold chunk. Different combinations yield different sized results, and the bigger the ingot that comes from the mixture, the bigger your cash prize is. PLAY FOR REAL MONEY!